Bought our first jack, Safari Country King Ebony, to start breeding. Waiting on our first foals to be born, finally, in the summer 3 jack foals born within 30 days of each other. Smooth easy births and so much fun. We went to a driving clinic because I thought that looked like fun. Again Jim enjoyed driving and I did not. We needed a trailer with living quarter to do all this showing, so Jim found one in North Florida and we drove from Texas to pick it up. That fall Jim's young teen age granddaughter, Tiffany, came to live with us and decides she wants to show. So that added another person to our show family and our living quarter trailer. Tiffany realizes she needs one of her friends to keep her company and help her, so Tenisha came with us to the shows. It was work, a good time together and the start of us promoting youth in the show ring. Tiffany and Tenisha showed Stetson and Sterling, while Jim showed Shook. We won every color ribbon and enjoyed the show season. In August our first jennet foal was born so we named her Lil Graceland Lisa Marie. Finally, a girl. I started to really like red donkeys and decided it was time to search for a red herdsire. I liked Quarter Moon Ticker Tape, so decided I needed one of his sons and ended up with two. Quarter Moon Red Light would be gelded and become Tiffany's new show donkey. They did so good in the show ring, she trained him herself. Quarter Moon Gold Coast (a little doll) would eventually be our main herdsire. It is a BOY!!! Lil Graceland Speedway is born in September, Dam Cobra's Nina Bonita and Sire My World Red Alert. He is so small 20”. OH NO! He is not red, but nice color like Nina. We buy Li'l Angels Miss Diane to be our next jennet show donkey. Her first show, on her first birthday and she wins a blue ribbon at State Fair of TX. State Fair of Texas, Jim and The Red Gates Stetson win a belt buckle for NMDA High Point Green Adult, really proud of these accomplishments! QM Gold Coast first foal is born July 20, 2009 Lil Graceland Gold Record and he is red. It was love at first site. Big plans for this little boy. State Fair of Texas Tiffany and QM Red Light wins a belt buckle for NMDA High Point Youth at State Fair of TX. 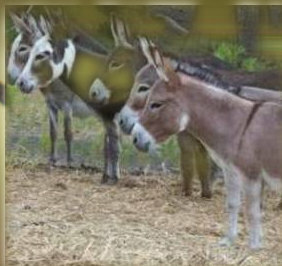 Still having babies, not buying ... trying to downsize our herd we have to many donkeys. First foal 2012 Lil Graceland Miss Clawdy and Lil Graceland Fun In Acapulco have a spotted jack named Heart Break Hotel. Heartbreaker has a heart shaped spot on his neck. He is a keeper. We have wanted a great looking spotted jack for years. Much needed rain and a mild winter, so far. Dam is If I Can Dream and Sire is Lil Graceland Speedway. First show of 2012 show season, Jim and King Creole win High Point Miniature Donkey Green at Ft Worth Stock Show. Beautiful belt buckle! St. Paddy's Drive Fest in Navasota at Good Hands Training Center. A fun day of driving. Six longears competing, Jim and Creole take home a 3rd place and a 4th place. All ribbons were green. Our youngest sire Lil Graceland Gold Record, first foal born, a light red jack. Name will be Lil Graceland Hit Record. Spring and more rain. We are not complaining. SDMS Spring Show "Come and Take It"
Two more Gold Record foals. Baled 600 plus square bales. This hay will really help us. So thankful. Had a great time at the Rose Rock Festival in Noble OK.
Great show and so proud ... ribbons in all colors. I went for a drive (yes, in the cart) with Stetson. My first time driving and I enjoyed it. People keep trying to talk me into being an exhibitor at shows. "People, I DO NOT WANT TO SHOW"
Traveled to Deepwater Missouri for a Fish Fry and donkey fun at Kurt and Vicki Sherman's farm. Saw their breeding jack and loved him. They generously allowed us to bring My World Bubba home to Lil Graceland to breed 6 jennets over the next year. My World breeding is one of our favorites, so thrilled to have Bubba for a year. Attended Ozark Empire Fair in Springfield, MO. Large classes with no divisions. King Creole placed 5th in Pleasure Driving with 16 in the class. This was not Creole's best show, we think he was tired from the long drive and missing his friends. We have some things we need to work on before the next show. August 3, 2012 Nina Bonita had a tiny 17" red jennet. This was during the Summer Olympics so we strayed from the Elvis names and we are naming her Katie Bell after the USA diver. QM Gold Coast is Katie's sire. We one some ribbons and had a great time with friends from all over the USA. We had to stay in motels. Our LQ trailer needs some major body work from weather damage. Looking forward to being back in the RV Parks. Show season is over. Now to get caught up at home and on the farm. Maybe find some Christmas parades. Showing is fun! we went so many places in 2014. Looking forward to what we have planned in 2015. We did it!! We made to the National Show in Red Bluff CA and back home safe and sound. Came home with some blue ribbons by CC and Creole for driving. Our traveling friends won championships. Great experience. CC won 1st Place in Green Pleasure Driving. back to back shows in TN. What fun!!! ADA Music City Donkey Show at Clearview Farm and The Great Celebration. We had a great time, won some ribbons and met new people. Thanks to Bob and Debby Miller of Millers Meadows for making this trip possible. Our Green gelding Soldier Boy showed at The Celebration with Vicki Taylor. We had a great show in Buffalo TX. Decided to only show in halter. Springfield won 2nd jack halter class against some very nice young jacks. Our young friend Izzie did her first show with Ms Missy at State Fair of TX. We are slowing down on showing... we realized that chores and projects were neglected with all the shows in 2015.... so we are spending the summer at home. Found a fun place to go in Oklahoma. Horse Heaven Resort. Great for driving and relaxing. Family fun!! Our 2016 show season is over! We won every color ribbon, including some championships. So proud of our show string, Vicki, Silver, Creole, Beth, Soldier Boy, Jukebox, Glamour Girl, Springfield and Pinki. Fun shows in 2016!! Especially the new show at Arkansas State Fair. We sold donkeys to some awesome homes. Some will show, some will breed and some will be loving pets. Always glad to meet new mini donkey owners and help them get started.